I don't have any advice for him. It's his decision. If he wants to play here, he's going to play here. He doesn't need advice from anybody to convince him otherwise. If he doesn't want to play here, then we don't want him here. • Referee Jeff Triplette got caught on an open mic saying mean things about his replay official. • Lance Stephenson, pride of Coney Island, allegedly threw his girlfriend down the stairs in front of a Brooklyn home. 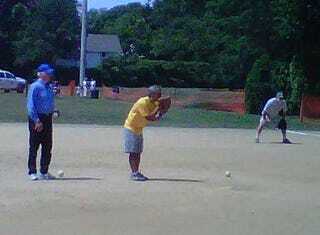 You could not be any more of a douche at a charity/celebrity softball game than Mike Lupica. He takes everything way too seriously and has even argued with the ump about balls and strikes when someone else was at bat. Everything you have heard about this man is true.